There are two major areas covered by this current Special Issue: Cleaner Fuel Technologies and Waste Processing. In addition, the Special Issue, also includes some recent developments in various fields of energy efficiency research. The first group of contributions considers in detail, hydrogen production from biomass and hydrogen production by the sorption-enhanced steam methane reforming process (SE-SMR). Biomass-related technologies are also discussed for a design of an integrated biorefinery, production of clean diesel fuel by co-hydrogenation of vegetable oil with gas oil and utilization of microwave and ultrasound pre-treatments in the production of bioethanol from corn. Waste Processing aspects are considered in the second group of papers. This section includes integrated waste-to-energy plants, utilisation of municipal solid waste in the cement industry and urban supply and disposal systems. The third topic is intentionally made rather loose: it includes different research topics on various aspects of energy efficiency, e.g. resource-saving network design, new research on divided wall columns, vehicle logistics as process-network synthesis for energy consumption and CO2 reduction. In their studies, Effects of feedstocks on the process integration of biohydrogen production, Domenico Foglia, Walter Wukovits and Anton Friedl from Vienna University of Technology, Vienna, Austria; Mattias Ljunggren, Guido Zacchi from Lund University, Lund, Sweden and Krzysztof Urbaniec, Mariusz Markowski from Warsaw University of Technology, Plock Campus, Poland (Foglia et al. 2011) discuss potential approaches to sustainable production of hydrogen. In particular they consider the problems and implications of the use of renewable resources for its production and fermentation of biomasses as a viable way. Simulation models for a two stage fermentation process were used by the authors to integrate the process steps necessary to produce pure hydrogen from biomass. Process options with barley straw, potato steam peels and thick juice as feedstocks have been compared on the basis of process balances. Heat integration and recirculation of process effluent were used to reduce high water and heat demand (Klemeš 2010; Klemeš et al. 2011). The authors show that with integrated solutions, the production of hydrogen as an energy carrier is technically feasible with all the feedstocks considered. Another approach to hydrogen production is discussed in Numerical study of hydrogen production by the sorption-enhanced steam methane reforming process with online CO 2 capture as operated in fluidized bed reactors, by Yuefa Wang, Zhongxi Chao and Hugo A. Jakobsen (Wang et al. 2011) from Norwegian University of Science and Technology—NTNU, Trondheim, Norway. The authors developed a three dimensional Eulerian two-fluid model with in-house code to simulate the gas particle two phase flow in fluidized bed reactors. The model combined with the reaction kinetics was used to study the CO2 capture with Ca-based sorbents in the steam methane reforming process. The SE-SMR process was carried out in a bubbling fluidized bed reactor. The authors observed very high production of hydrogen in SE-SMR compared with the standard SMR process. The hydrogen concentration was near the equilibrium. The authors studied the breakthrough of the sorbent and the variation of the composition in the breakthrough period. They also examined the effects of inlet gas flow rate and steam-to-carbon ratio on the reactions. 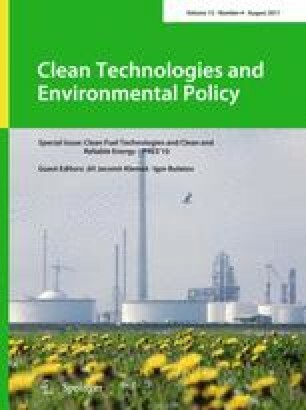 Partially bio-derived fuels can be technically and economically justified which is shown in the work of Csaba Tóth, Péter Baladincz, Sándor Kovács, Jenő Hancsók from University of Pannonia, Veszprém, Hungary, Producing clean diesel fuel by co-hydrogenation of vegetable oil with gas oil (Tóth et al. 2011). The authors investigated the production of partially bio-derived fuels in the gas oil boiling point range. A catalyst able to produce product mixtures with high yield, and limited sulphur content from mixtures of high-sulphur gas oil (about 1.0%) and vegetable oil raw materials was selected. Various mixtures of gas oil with different vegetable oil content were analysed. The authors show that both the vegetable oil conversion reactions (saturation of olefinic double bonds, deoxygenation) and the gas oil quality improvement reactions (heteroatom, mainly sulphur removal, aromatic content reduction) took place during the tests. Under the favourable operational conditions the main properties of the high-yield (>90%) products mostly satisfied the requirements of the standard of diesel fuels -EN 590:2009 (European Committee for Standardization 2009). The authors show that an existing hydrogenation plant may be suitable for the co-processing of vegetable oil and gas oil mixtures. The quality improvement of gas oil (sulphur, nitrogen and aromatic content reduction) and the vegetable oil conversion to n- and i-paraffins can be achieved in one go. The products have an increased n- and i-paraffin content, so their combustion properties are very favourable, and the emission of particles is lower. An interesting application of microwave and ultrasound technologies is investigated in the work of Svetlana Nikolić, Ljiljana Mojović, Marica Rakin, from University of Belgrade, Belgrade, Serbia and Dušanka Pejin and Jelena Pejin from University of Novi Sad, Novi Sad, Serbia. In their paper titled Utilization of microwave and ultrasound pretreatments in the production of bioethanol from corn (Nikolić et al. 2011) the authors examine bioethanol production process by simultaneous saccharification and fermentation (SSF) of corn meal by Saccharomyces cerevisiae var. ellipsoideus yeast in a batch system with prior ultrasound or microwave treatment. The optimal duration of the pre-treatments and the SSF process kinetics were assessed and determined. Also, they investigated and compared the effect of ultrasound and microwave pre-treatments on ethanol yield and productivity. An optimal duration was determined for both pre-treatments. The authors show how ultrasonic and microwave pre-treatments effectively increased the glucose concentration compared to untreated control sample. Their paper analyses the improved ethanol yield and productivity during the SSF process due to the ultrasound and microwave pre-treatments. The application of microwave pre-treatment resulted in higher glucose release during liquefaction and consequently in higher ethanol concentration, compared to the ultrasound pre-treatment. The second group of papers focuses on the Waste Processing. It opens with Waste incineration with production of clean and reliable energy, by Martin Pavlas, Michal Touš, Petr Klimek, Ladislav Bébar from Brno University of Technology, Brno, the Czech Republic (Pavlas et al. 2011). The authors examine waste fired power plants. These facilities focus on electricity production whereas heat supply is diminished and operations are not limited by insufficient heat demand. The authors report the results of simulation which prove that increase of net electrical efficiency above 20% for the most common units is problematic and tightly bound with increased investments. The authors show that very low useful heat production in Rankine-cycle based cogeneration system with standard steam parameters leads to ineffective utilisation of energy. This is documented in their paper with the help of newly developed methodology based on primary energy savings evaluation. The authors’ suggested approach confronts the common method for energy recovery efficiency evaluation required by EU legislation—Energy Efficiency R1 Criteria (European Parliament 2008). They used a new term—highly efficient waste-to-energy. Conditions under which the incinerator is classified as highly efficient are specified and analysed. They show that once sole electricity production is compelled by limited local heat demand, application of non-conventional arrangements is highly beneficial to secure effective energy utilization. In a case study, the authors evaluated a system in which a municipal solid waste incinerator is integrated with combined gas-steam cycle. The prospects of municipal solid waste ash utilisation in the cement industry are analysed by group of authors from Hong Kong University of Science and Technology (Hong Kong, China) Charles Hoi King Lam, John Patrick Barford and Gordon McKay in their work Utilization of Municipal Solid Waste Incineration ash in Portland cement clinker (Lam et al. 2011). High contents of SiO2, Al2O3, and CaO in Municipal Solid Waste Incineration (MSWI) ash is a valuable property which enables the ash to be partially used as raw materials for cement clinker. The authors discuss a material utilisation system for the incineration waste ash residue in comparison to the option of disposing these ashes into landfill. They studied the feasibility of replacing clinker raw materials by waste ash residue for cement clinker production. Both MSWI bottom ash and MSWI fly ash are evaluated. The ashes were mixed into raw mixture with different portions of ash residue to produce cement clinker in a laboratory furnace at approximately 1400°C. X-ray diffraction and X-ray florescence techniques were used to analyse the phase chemistry and chemical composition of clinkers in order to compare these ash-based clinkers with commercial Portland cement clinker. The rapidly developing urban regions in Asia, Latin America and Africa pose a problem for urban planners in terms of development of adequate disposal systems. From this angle, the work of academics and urban planners from Germany and Vietnam—Hans Reiner Böhm from Infrastruktur & Umwelt, Sophie Schramm, Susanne Bieker and Carola Zeig from Technische Universität Darmstadt, Germany and Tran Huy Anh, Nguyen Chi Thanh from Architects Hanoi, Vietnam—titled Semicentralized Integrated Supply and Disposal Systems of Flexible Infrastructure Strategy for Rapidly Growing Urban Regions provides a promising attempt to find a systematic approach to the problem (Böhm et al. 2011). Rapidly growing cities face the problem of the provision of infrastructures and public services lagging behind the rapid urbanization. The increasing energy cost and the imperative to reduce the CO2 emissions complicate the situation. The semi-centralised integrated approach, developed by the authors for rapidly growing urban regions in China, with its flexibility offers a sustainable solution to cope with these developments. The centralised systems which began to be implemented in the industrialised countries more than 100 years ago are no longer the appropriate way. This paper presents objectives and the first results of an R&D project aiming at the adaptation of the semi-centralised integrated approach to the case of Hanoi. This rapidly growing capital of Vietnam urgently needs a contribution to the solution of the sanitation problems of both the old City Centre and the urban expansions. The third group of papers was intentionally made more general to cover and incorporate various recent developments in such different fields as energy-efficient distillation systems, logistics and the state-of-the-art integration techniques. The first paper (Chen et al. 2011) in this group is titled Synthesis of Property-based Resource Conservation Network in Palm Oil Mills with Time-varying Process Disturbance and its authors—Cheng-Liang Chen, Jui-Yuan Lee from National Taiwan University, Taipei, Taiwan, ROC and Denny Kok Sum Ng and Dominic Chwan Yee Foo from University of Nottingham Malaysian Campus, Selangor, Malaysia—have been working on the forefront of property integration technology for a long time, e.g. (Foo et al. 2006). Their work presents a mathematical model for resource conservation in a palm oil milling process via property integration. The focus is given to the clay bath system for kernel/shell separation based on flotation principle. The current work takes a closer look at the unit and considers it as a semi-batch unit with time-dependent process disturbances, which is different from simplified previous works where the clay bath separator was considered as a continuous unit. The design problem was formulated by the authors as a nonlinear program based on a superstructure approach, with the objective set to minimize the fresh resource consumption. An illustrative case study is provided to demonstrate the proposed model. László Szabó, Miklós Balaton, Sándor Németh, Ferenc Szeifert from University of Pannonia, Veszprém, Hungary focused on how to find better structures with minimal energy consumption in their paper titled Analysing divided wall columns (Szabó et al. 2011). The divided wall column (DWC) system has been attracting the attention of researchers for quite a long time as a promising energy-saving alternative for separating multi-component mixtures. The innovation of this equipment that the authors suggest is the wall which divides the inner space of the tower separating the feed and the side stream-product zones. This wall prevents the mixing of the side stream with the feed stream. The dividing wall column has greater efficiency than common column sequences. The conventional columns with side stream can be converted to DWC. In this paper, the authors investigate different constructions of the DWC with simulation experiments by implementing them in the Aspen Plus simulator using the Radfrac unit of the software. The effects of the main parameters of the divided wall column like the split ratio, the height of the wall and the vertical position of the wall are analysed. Logistical problems of optimal assignment of vehicles to transportation tasks are considered by Mate Barany, Botond Bertok, Zoltan Kovacs, Ferenc Friedler, from University of Pannonia, Veszprém, Hungary and L. T. Fan from Kansas State University, Kansas, USA. The authors propose a method and software for optimal assignment of vehicles to transportation tasks in terms of total cost and emission in their work Solving vehicle assignment problems by process-network synthesis to minimize cost and environmental impact of transportation (Barany et al. 2011). They transform the assignment problem into a process-network synthesis problem, which can be algorithmically handled by the P-graph framework (Friedler 2009, 2010; Barany et al. 2010). In the proposed method, each task is given by a set of attributes to be taken into account in the assignment, and this is also the case for each vehicle. The overall mileage is calculated as the sum of the lengths of all the routes to be travelled during, before, after and between the tasks. Cost and emission are assigned to the mileages of each vehicle type. The P-graph framework provides n best suboptimal solutions that can be ranked according to multiple criteria, which is in addition to the globally optimal solution of the assignment problem. The authors also illustrate the viability of the proposed method by a case study.